Rather than head to Ibiza again for your Summer holiday, why not make it count in more ways than just your tan? While a organic spa holiday is our idea of heaven, we equally love the idea of a retreat or volunteering adventure for some ‘doing good’. From silent retreats, to luxury eco-lodges, take your pick from our summer destination wishlist. Read on. The Scarlet in Cornwall: If you think that a day at the beach is the ultimate spa day, you’ll love this seaside resort and its Summer Outdoor Spa Day. Herb House at the Limewood Hotel, Hampshire combines a raw food bar, holistic Ayurvedic therapies and organic facials, including ones from one of our go-to Great British Brands Pai. Basically, it ticks all the right boxes! Luckham Park, Wiltshire, is our best pick for weary city souls. 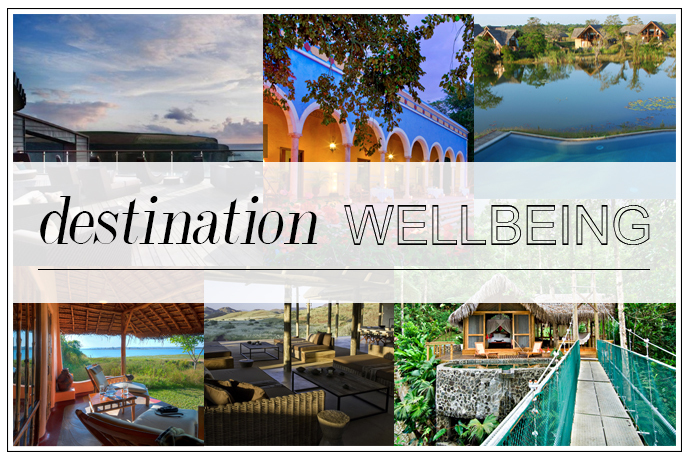 With specialist clinics in sleep and nutrition alongside yoga retreats, it’s a certified way to relaxation. We love to sound of chakra and sound healing at the Ila Spa. Cowley Manor, Gloucesteshire uses local ingredients from the British Isles in their treatments. Set in the beautiful Cotswolds, it’s a treat for senses and sight. Cristalino Lodge, Brazil: Love the sound of an Amazon sanctuary, ranked one of the best eco-lodges in the world? Then book yourself into this eco-luxury sustainable haven, set in a natural reserve spanning 28,000 acres of rainforest. Immersed in nature, it will allow you to get up close and personal with the stunning nature and wildlife. Unsurprisingly it’s on top of our wish list! Pacuare Lodge, Costa Rica: If you’re planning a romantic escapade with a little bit of adventure thrown in, few things can beat this lodge, located in the Talamanca Mountains and surrounded by the rain forest. It offers water rafting and hiking, as well as massage treatments using local, natural products. Jungle luxury? Count us in. Lammas, West Wales: This beautiful eco-village could well be in Middle Earth, but it’s actually Wales! You can only stay in the village by becoming a volunteer and working on one of their smallholding plots, to promote sustainability and biodiversity. Alternatively, drop in for one of their courses like the ‘Earth-Spirit Natural Connection Workshop’ and ‘Living in the Landscape’ throughout the summer. If city life has become a bit much and you’re missing that sense of community jump on the next train. Theravada Buddhist Monastery, Hertfordshire, All year-round – Can’t make it to an ashram in India? Look closer to home. Situated just outside of London, this monastery is open to anyone who is keen to develop their mindfulness and spirituality: you can drop in for workshops, or stay overnight and for an entire day as a ‘refuge’ from the stresses of the world. Otherwise, take part in one of their retreats – observed in silence and involves a tech-detox. Take a look at their upcoming ones here. School of Life Summer School, London – July 25th – 26th ­– Stuck in the city? Want to reassess your life’s direction? Book yourself into this intensive five-day long programme, which will give you the tools and strategies to help you understand and untangle your big life’s dilemmas, be it work, love or family. Refreshing and inspiring, it will be no doubt epiphany-inducing too. Jane Kersel’s Ritual Retreat, Spain, September 19th – 26th – Hosted by our resident yoga expert Jane Kersel, this week-long retreat will allow you to press the ‘reset’ button, thanks to a mixture of activities ranging from reiki, yoga and acupuncture, through to swimming to horse riding. You’ll be in very capable hands and residing in a beautiful farm in the Andlusian hills. Book a spot here. PadmaKarma Retreat, India, All year-round – As far as yoga retreats go, few things can beat a trip to India, the cradle of yoga. Padma Karma offers two week-long retreats in Kerala where you can work on your asanas and be surrounded by lush palm trees, jungle and white sands. If you’re considering training to become a yoga teacher, check out their training courses which last up to a month. Both will be life-transformative, to say the least.